Living a healthy life begins with forming healthy habits. Optimum health and weight loss are not simply about nutrition and exercise. I believe that failure to keep to a diet is not a lack of willpower or motivation. If we ignore the mind-body connection, we cannot achieve long-term success, even with the most advanced nutritional and fitness principles. It’s only a matter of time before we revert to our original habits—even with the best intentions and resolutions. It’s so hard to change because we’re creatures of habit. Habits require very little self-control because we do them automatically. They permeate almost every second of our existence. For example, let’s look at the average person’s start to each day. You wake up, step out of bed, and put on your slippers. Off to the bathroom you go, where you wash your hands, brush your teeth, wash out your mouth, and use the toilet. You might take a shower, get dressed, walk down the stairs, eat breakfast, make a hot drink, and jump into the car . . . so your day starts. You wake up around the same time every day. Even something as elementary as walking down a flight of steps is habit based. You do it now automatically, but watch a child learn to do it. They measure every move, carefully maneuver each step, and still stumble down the steps. Practice (habit) makes perfect, and before long the child is jumping from step to step. Brushing teeth only takes a minute or two, but when you first learned, your mother needed a vacation after every brushing. When you drive, you can do three things at once (although you really should not). You manage to juggle between talking on the phone (Bluetooth), drinking a hot drink, and browsing between radio stations. But do you remember the intense attention you gave driving when you got your learner’s permit? Try driving in a car with a new teenage driver. It’s extremely stressful, though you need to pretend that you’re calm with a huge smile plastered on your face. Just the presence of another car on the road poses a threat! How about reading and writing? It only takes a few seconds, but it took you years to learn how to do it when you were a child—years of struggling to string letters together and thousands of hours of homework. We are definitely creatures of habit! We’re comfortable with routine, and research has shown that most people can only tolerate a small amount of routine disruption before experiencing discomfort. Making even the slightest change in your daily routine will help drive this point home. Try switching your pillows to the other side of your bed. It almost feels like you’re hanging from the ceiling. Try switching your usually accustomed seat at the dining room table and you feel lost. If you ever visit a foreign country where they drive on the opposite side of the road, try driving on their side (not on a freeway, please). I’m sure you can think of many other personal examples. 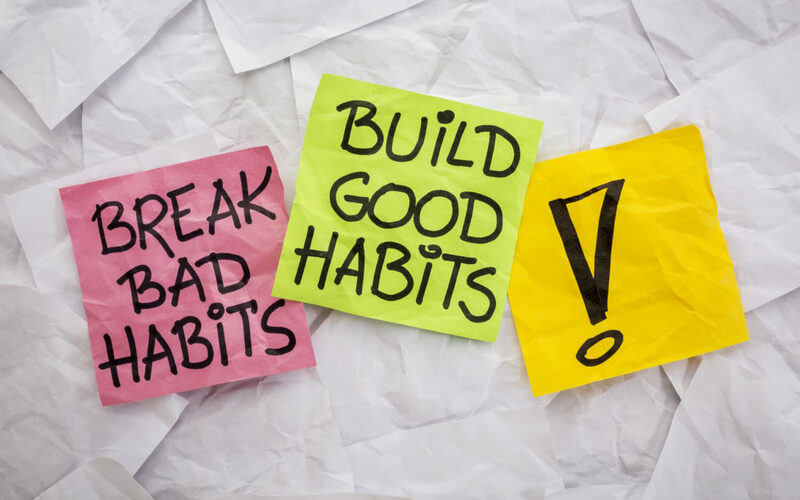 It should be quite obvious by now why habits play such a crucial role in our lives. Can you imagine what would happen to our lives if we had to give the same attention and thought to all our actions as we did when we first learned to do them? I think chaos or overload would be an understatement! So habits become automatic and a fixed part of our personalities. We can appreciate why we cannot simply change our behaviors or habits overnight. It’s not surprising that many diets fail. Sudden changes don’t take human nature into account. Self-control and willpower soon wane, and it’s not long before we’re back to where we started—our old comfortable habits—if we haven’t regressed even further. The Master Physicians link mind-body habits with our eating choices: One of the most powerful forces of human nature is habit, irrespective of whether are actions or perceptions. For instance, you may choose bad foods to which you are accustomed over good foods to which you are not accustomed even though it is the less correct choice. In his philosophical work, Maimonides stresses the power of mind habits: Within human nature is a love and inclination toward one’s habits. A person loves his habitual opinions, and he is protective of opinions with which he was raised. This often prevents him from recognizing the truth. According to Aristotle, even moral virtue ultimately depends on habit and not nature: Moral virtue develops from habit. Its name (ethike) is formed by a slight variation from the word ethos (habit). Nature does not produce virtues in us; it prepares in us the ability for their reception, but they are formed through habit. Let’s look at how habits play with our minds. How are habits formed in the first place? Let’s take the example of charity. I always thought that giving one dollar to multiple poor people was a nice gesture but relatively insignificant. After all, what can one really do with one dollar? Donating a large sum of money to a charity should be a much more significant act of giving. But in terms of character development, this is far from the truth. Maimonides shares this insight: Positive behavior characteristics are not acquired by doing great (positive) acts but rather through the repetition of many positive acts. For example, giving a thousand gold coins to one charity will not accustom a person to the trait of generosity, whereas giving one gold coin to a thousand different charities will do so. By repeating an act many times, an established behavior or emotional pattern is formed. In contrast, one great act represents an arousal to good, after which that motivation may disappear. Here we see a fundamental principle in human nature. Even a simple habit can have more of an impact on our personal development than a major motivational arousal. For example, you may experience an intense motivation to lose weight because of a health scare, or you may have a wedding soon and need to fit into that dress or suit. Yet that inspiration can often fade as your grandiose dieting plans lose steam. Setting simple, good eating habits in motion will have a more significant impact on your quest to lose weight. Why is habit so powerful, and what is really the difference between the first, second, and third time that we do something? After all, it’s exactly the same act repeated over and over again! I think most of us are aware that habits start off as simple acts, but what turns these simple repetitive actions into such a formidable emotional force? The answer is that real change takes place within, not without. I call this subconscious habit formation. This is possibly one of the most exciting subjects I have ever come across. I sincerely believe that after reading this principle, you will never look at the world in the same way again. If you then experience this feeling a second time, it combines with the original impression, thereby strengthening itself. Every time this feeling is experienced again, all the accumulated traces of the previous impressions combine with it. From here we can understand how the power of habit strengthens even the weakest feelings and how it creates learned desires that intensify over time. Over time, the most insignificant string of experiences can accumulate to become strong enough to overwhelm even a major experience. This is the power of habit! In other words, an “outer action” may be exactly the same every time you repeat it, but the “psychological impressions” of every minor experience, feeling, and image associated with that act, connect with its previous psychological impressions. You may have exactly the same experience or do exactly the same mechanical act, but each time it’s repeated, the impressions or traces left on your memory are much more significant because they accumulate from all the previous experiences or actions. The 5 Skinny Habits aims for emotional and physical health, mindfulness, and habit formation, while presenting a practical program in order to make permanent changes, at the right pace.